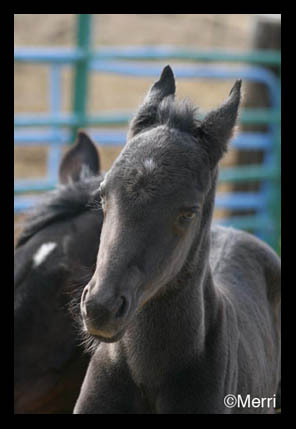 'Twas a dark and stormy night - and come early morning, this little Fluffy popped up in the neighbor's foaling pen. 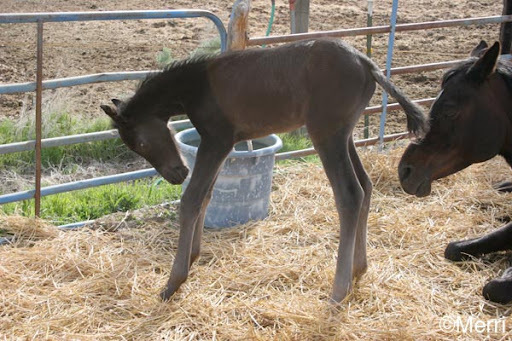 He is LJ Owyhee Tourmaline, a smokey black colt - mother is a bay, father is Lost Juniper Ranch's LJ Owyhee Moonstone, a cremello Quarab. Little 'Tourbo' was possibly re-thinking his timing, as the cold wind blustered and howled, and he shrunk up and shivered, neck scrunched down like a turtle and short curly tail tucked between his legs, huddling near mama as she rested from her adventure. After a while, he was wanting to lay down, and studied his long legs, but couldn't quite figure out how to make them fold. Instead he took a short little gambol, then came back to mama, clearly poking around looking for breakfast. Finally mom got up, Tourbo zoomed right on in and had a nurse (isn't it amazing how they know just where to find the milk? ), and all was right with the world. Welcome to the crick, Tourbo!